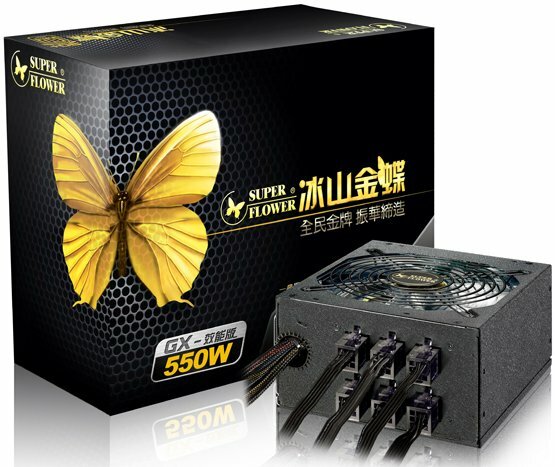 TechPowerUp received details about the Super Flower GX550 (SF-550P14XE), a new semi-modular power supplies with 80Plus Gold certification. The unit has a single +12V rail capable of delivering 45.5A and is cooled by a LED illuminated 130mm fan. Pricing and availability is unknown. The PSU packs a semi-modular cabling design, with key cables such as 24-pin ATX and 8-pin EPS connectors being fixed, with other connectors being modular. The modular ones feature flat cabling, which has its advantages with cable-management. The GX550 features a single 12V rail design, the single 12V rail can deliver 45.5A of current. It packs active PFC, and a patented LLC resonant converter design.